The feminine aspect of the divine, Sophia, has a deep presence in the Wisdom Hebrew texts of the Old Testament and was prominent in some of the earliest Christian writings. By the time the New Testament was largely established in the late 4th century AD, Sophia was all but lost within the outer teachings of the established church. Nonetheless, her presence continued to flourish, even to this day, as a source of inspiration within the lives and writings of Christian mystics. This 3-part workshop will explore what happened in first century AD with the dispensation of a novel creation mythos whose primary character was Sophia. 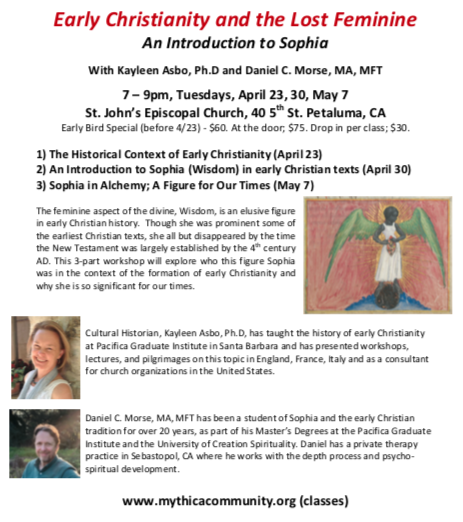 We will look at how early Christianity evolved in the first few centuries AD to where Sophia and the divine feminine was significantly marginalized. 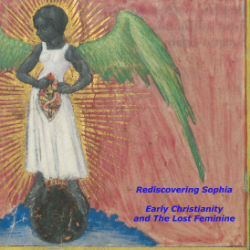 We will also investigate how she offers us a valuable way of stepping into our own personal process, with the help of the depth psychology perspective, alchemy and the life of Thomas Aquinas, from whom this dark winged image of Sophia is attributed. As we rediscover this meta divine feminine Sophia, we will be looking at why she is so significant for our times. 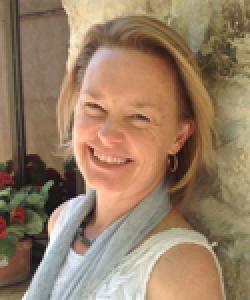 Kayleen Asbo, Ph.D, Cultural Historian, has taught the history of early Christianity at Pacifica Graduate Institute in Santa Barbara and has presented workshops, lectures, and pilgrimages on this topic in England, France, Italy and as a consultant for church organizations in the United States. 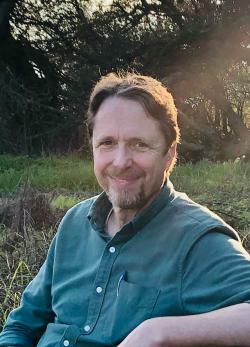 Daniel C. Morse, MA, MFT has been a student of Sophia and the early Christian tradition for over 20 years, as part of his Master’s Degrees at the Pacifica Graduate Institute and the University of Creation Spirituality. Daniel has a private therapy practice in Sebastopol, CA where he works with the depth process and the pursuit of psycho-spiritual development.